← Wednesday 10th June 2015 – More Strawberries! Thursday 11th June 2015 – I found some Leeks!! My sister is very kindly giving me her greenhouse. I know I’ve got one at home and it’s 6 foot by 6 foot. But I’m not going to turn down a free greenhouse. It was given to her, but she no longer needs it, so she’s giving it to me and it’s 6 foot by 8 foot!! I know, I’m so excited!! So today I cleared the area where it’s going to go. My sister and I are putting it together, hopefully tomorrow, weather dependant. It’s supposed to thunder and lightning, and I’m not putting metal bits together when that’s going on. I just need to go and buy some weed suppressant and then some cheap paving slabs and I’m all set. I’ll do that tomorrow morning as we’re not putting it together until the afternoon because she works in the morning. Hopefully it’ll mean that I can grown some Tomatoes on the allotment and with them being in the greenhouse they won’t get blight. I live in hope!! My greenhouses new home. 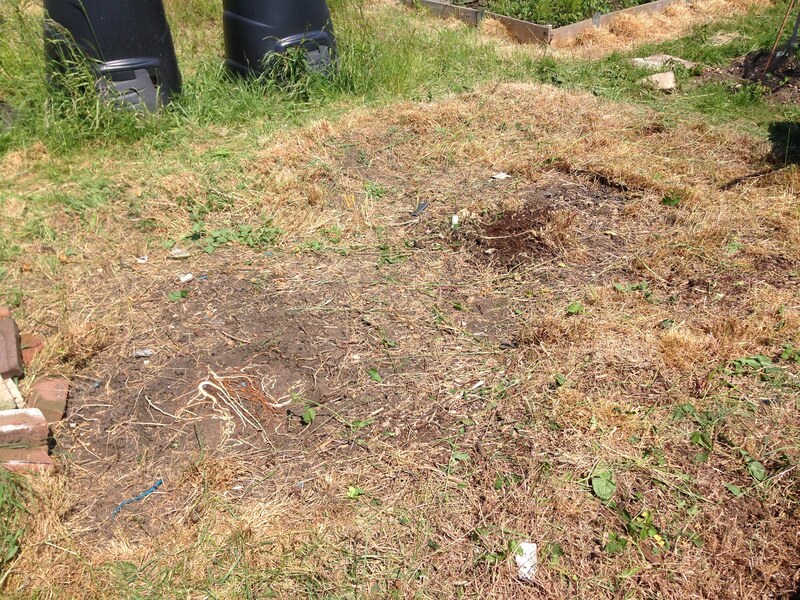 Some weed suppressant, wood chips and paving slabs and it’ll be ready. Once this was done I then started some more sorting out of various beds. My other Rhubarb bed needed some serious TLC. The Rhubarb had sent out seed heads so I took them all off and then started to remove the Sprouting Broccoli from last year, that has now finished. Oh and to my surprise I’d left some Leeks in, so I harvested those. there’s only 7 of them, but they’re good sizes. I thought I’d harvested them all, but clearly I didn’t. what a lovely surprise. After 4 hours I’d had enough and needed to come home. What little water I had left had gone warm….yuck, not very nice. Please be dry tomorrow then I can get my new greenhouse up, pretty please, I’m very nice. This entry was posted in Uncategorized and tagged Broccoli spring sprouting, claire's allotment, leeks, rhubarb, tomatoes. Bookmark the permalink. 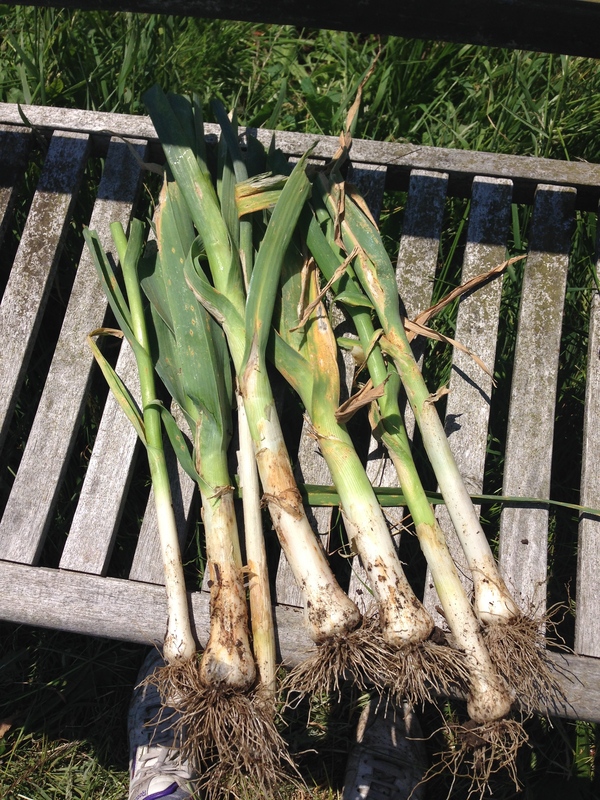 6 Responses to Thursday 11th June 2015 – I found some Leeks!! How exciting about your greenhouse. I do like the before and after shots. If you do this, it makes you realise how far you’ve come. The frame is up. On Friday we’re doing the glass!! The greenhouse is all set up and I’ve already got some Tomatoes growing in it.